The cushion cut engagement rings, also known as the pillow cut rings, are the second most wanted shape for engagement rings after the round cut. They has been enjoying huge popularity among all, especially after seeing many celebrities donning this shape. As a matter fact, there was a time when this cut was the most favorite cut for engagement rings as well as other kinds of diamond jewelry. Across the span of the last 100 years, the cushion cut engagement rings had to let go of the throne for the more modern and the current ruler- the round cut. 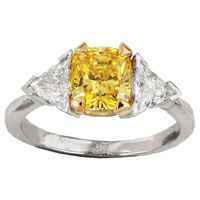 However, It still enjoys a huge fan base and is the second most popular cut when it comes to diamond engagement rings. An Instructive Essay on Shopping Cushion Cut Diamonds. If you are looking for a Cushion cut engagement ring, remember, you can choose from two types of cushion cuts. The first one is the good old antique style. These amazing vintage style jewels have a unique legacy of being a favorite of the Monarchs. The history of royal heritage they bring along with them makes us feel like we are the royals ourselves. The techniques used to make vintage cushion cuts differ from those of making the modern ones. The modern variants of cushion cuts diamonds are very popular too, and they tend to be bigger and brighter than the latter. The only "flaw" in the cushion cut diamonds is actually what makes them stand apart from every other design. The unique attribute of the cushion cut engagement rings is they shine a tad bit less in comparison to the round cut. This attribute is unique because this cut was specifically made to gleam in the candle light. It was designed in the era of candles, the times of the kings and queens. And this is exactly why they don’t respond well to the modern light sources. Now you know why candlelit dinners are the most successful proposals. The cushion cut also makes a diamond more durable as the neatly trimmed corners make it least prone to accidental chips and cracks. 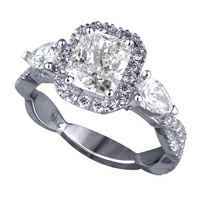 Nowadays, you can buy elegant cushion cut engagement rings in vintage as well as the modern versions. It’s true there are slight differences in these two designs. 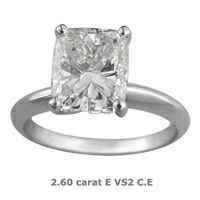 This is because the modern cushion cut engages the latest technologies in comparison to their vintage counterparts. Even then, that charm and romantic brilliance these jewels emit remain dazzling as ever. Before you plan to buy a cushion cut engagement ring, do keep in mind that these cuts are made with strict precisions, but the guidelines are a lot more lenient than the other ones. Another important factor to remember is that this cut was specifically made to shine under the candle light and won’t shine as brilliantly as the round cut under normal light. So, if you want to make your proposal the most romantic and memorable thing you’ve ever done, we strongly suggest you go for the cushion cut engagement rings and get down on one where there are lots of candles.